The Lady Wolves played a tight game against Madison College on Friday afternoon. 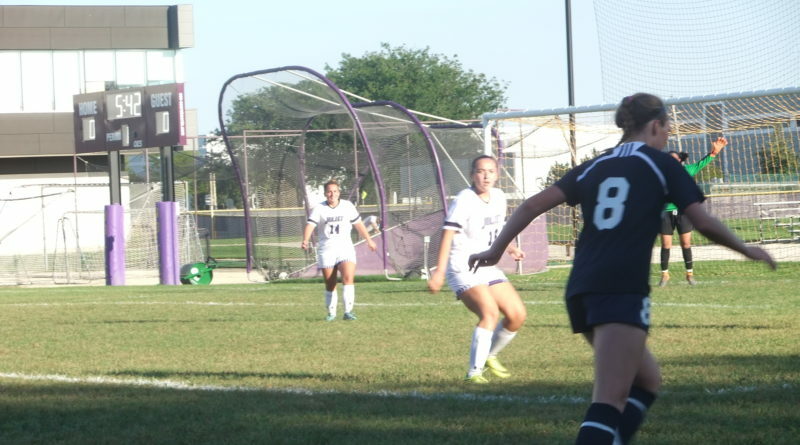 Madison College is JJC’s biggest competitor according to Hailey Arlis, one of the Wolves’ forward players until getting injured in the first game of the season. When asked further about the Lady Wolves season, Arlis said the Wolves have a chance to go pretty far this season. The Lady Wolves have a lot of talent and they’ve been putting in a lot of hard work this season. The girls have been encouraging each other. Alyssa Baron, midfielder, echoes Arlis’ thoughts stating that Madison college is their biggest competitor. Baron says she’s proud of how the team has come and their performance on the field. The team has worked well together so far this season according to Baron, especially with the sporadic weather this season. Watching the game, you can clearly see how the players worked as a unit to attack the ball. In the first half, the Wolves played a good defense with the goalie stopping Madison from scoring two goals. The midfielders played the field well, keeping Madison’s players on their feet. Madison’s defensive players worked the field well too, keeping the Wolves from scoring in the first half. The second half began with Wolves goalie stopping Madison from scoring a goal. From there, it was a battle between the teams for the ball with neither team scoring until there were only seconds left in the game. Unfortunately for the Wolves, Madison scored the first and only goal with Madison College winning 1-0. But, the Lady Wolves put up a good fight against Madison College seeing as both teams are pretty equally matched in skill. The Lady Wolves played against a tough team and handled it well. The Lady Wolves can go far this season if they attack the ball and keep up with the good defense.